Sam has been awarded a 1st Class Honours Degree in Economics from Nottingham University. Sam has worked hard for this result over the last 18 years since starting, at age 3 at the Grantham Prep. School in 1998. Sam’s parents wish to thank all the staff at Grantham Prep for creating the platforms from which Sam has pursued this wonderful result. Sam has accepted a position with Buzzacott LLP, in the City, which he starts in August. We wish him a successful future there. Rachel is currently studying at Abbotsholme School, Rachel has been studying for four years and is a full border. She is in Year 12, studying for A Level Maths, English Literature, Chemistry and Extended Project Qualification. On leaving TGPS he achieved a scholarship to Summer Fields School, Oxford (boys prep school.) Harry is now at Eton College and will be taking his GCSE’s this summer. India spent a term in Sauveterre, Near Toulouse, France, learning French. India went to Tudor Hall School from TGPS and has just taken part in an exchange scheme with a girl’s day school in Toronto, Canada for half a term. Katie spent a term in Sauveterre, Near Toulouse, France, learing French. Katie also went to Tudor Hall School. Jamie gained a scholarship to Summer Fields School, Oxford (boys prep school). On leaving TGPS Alex joined Carres Gramar School, Sleaford. Alex has played tennis for the Boston A Mens Doubles & Mixed Doubles. He came 3rd in the County for Boys Under 14 doubles (summer 2010). Alex achieved a Level 5 for Leicester Tigers Rugby course. Alex is also part of the Lincolnshire Youth Concert Orchestra – Grantham String Orchestra – desk two and Sleaford strings – first desk. He has also been nominated for the Lincolnshire Chamber Orchestra for grades 7+. Alex has also formed a band with three of his friends, they play anything from rock to folk music. Oliver Bitowt is currently Head Boy at The King’s Grammar School having recorded a remarkable 160 IQ genius score in the recent Mensa tests carried out at the school. He is taking the winter papers for his A levels in Maths, Further Maths, Physics and PE. He is planning to study Mathematical Sciences at Bath, Loughborough or Edinburgh University (choice not yet taken but offers held) while continuing his swimming. He has continued his love of swimming and continues to swim at County, Regional and National level. He participated in both the British and Scottish Commonwealth Games Trials last spring. He is a member of the British Swimming Talent programme for Distance Freestyle and Open Water this year. He is also a Young Ambassador for Sport in Lincolnshire and a sponsored athlete on the Lincolnshire Elite Athlete Programme (LEAP). Oliver was selected to swim at the UK School Games in September 2010 in the 100m Backstroke where he took the bronze medal. This year he has been re-selected to swim in the 2011 School Games in September in the 1500m Freestyle representing England Central against 3 other English regions, Scotland, Ireland and Wales. Oliver has qualified for the British Championships in Leeds in the 1500m in March 2013, and the Youth Nationals in Sheffield in July 2013 and is training hard towards those meets. He will be swimming in the BEST FEST Open Water festival in Majorca in the May half-term where he hopes to gain valuable experience in marathon swimming over 5, 7.5 and 10km distances. Oliver was recently awarded the Lincolnshire Young Sportsman of the year award for 2012 and was reselected for the LEAP programme (Lincolnshire Elite Athletes Programme) for the 6th year. He has also recently been appointed Senior Boys Captain of Lincoln Vulcans Swimming Club where he has trained for 8 years since his days at Grantham Prep. Owen will graduate on Friday from Emanuel College, Cambridge with a first class degree in medicine. He now has a further 4 years of training to do at Addenbrookes Hospital. Alexander finished his GCSE’s two weeks ago having done 24 exams. He is seriously keen on becoming a Doctor, he will be taking part in work experience this summer at the local Doctor’s surgery and Dove Cottage Hospice. Caroline has just finished her first year at Oakham and she is very happy there. Both Alexander and Caroline are still mad keen on their equestrian activities, Caroline with her eventing and Alexander with Polo. Last summer Alexander was picked as one of 16 under eighteen year old’s to play in a Young England squad and from there they selected 8 players to go to South Africa last October and he was one of them! A fantastic achievement. Tom is in his second year at Birmingham doing Theoretical Physics. Harry is in his AS year at the King’s School, Grantham. Aneurin Banfield, left Grantham Prep. in July 2008 to go on to grammar school, he has achieved a stunning distinction at Grade VIII with 96% on the Jazz Saxophone. Aneurin began lessons in Year Six at the Grantham Prep. School and has reached the top examination level in just 4 and half years. In 2010 he became the youngest member of the Lincolnshire Jazz and Rock Academy at fourteen years old and this summer travels to Austria as soprano saxophonist with the Lincolnshire Symphonic Wood Orchestra. Aneurin still regularly helps out with the Grantham Prep. School summer concerts, and this year returned with the King’s School Soul Band to give workshops to some of our current talented crop. Holly is to represent Lincolnshire in the School’s Cross Country Championships in January and has also been selected for the Lincolnshire County Under 13 Badminton team. Following a 2 and a half hour long audition, Kate assed her audition to join “Youth Music Theatre UK” for one of their summer productions. Kate will spend 2 weeks in August 2013 based at the Barbican Theatre in Plymouth rehearsing for their production of “Le Tabou” This is a huge accolade for Kate. Many congratulations to Phoebe who has achieved 10 A* and is going to attend Magdalen College. Paddy has gained an All Round Scholarship at Radley College which he will commence in September 2013. Congratulations Paddy. Jac is going to Bath University to study Economics and Politics. Joshua has passed his audition and has been accepted into the Guildhall School of Music and Drama, London – he starts the Junior Guildhall Drama programme in September. Cadet Sergeant Major Taha Nazir, aged 17, has completed the most senior course an army cadet can take and now holds the status of being a Master Cadet. He undertook the week long course at the Cadet Training Centre at Frimley Park in Surrey, during which he developed his skills in field craft, leadership, weapons handling and drill. He then demonstrated this expertise by delivering lessons in these areas to his fellow candidates. The course was only open to an exclusive number of cadets and Sgt Major Nazir is now eligible to be considered for further promotion to the rank of Cadet Regimental Sergeant Major, which would make him the most senior cadet within Lincolnshire. He is currently a student at The King’s School and will be attending university with a scholarship from the British Army as he hopes to become a Doctor with the Royal Army Medical Corps. Joseph has achieved a First Degree in English Literature at Kings College, London. Timmy received a Double Distinction in Sports Development and Coaching & Fitness at Grantham College and is currently working with Nottingham Forrest FC Academy Under 10’s and will be going to Sheffield Hallam University to study Sports Coaching and Development. Henry is studying Biology and Maths A level and Chemistry Pre-U this year, having taken his French A level last year gaining an A*. He also gained an A* for his EPQ. He continues to play the trumpet and took his grade 8 last year, gaining a merit. He plays in the CCF Marching Band, the wind orchestra and the Oundle School Jazz Orchestra. He is playing again this summer at the Montreux Jazz Festival with the Oundle School Jazz Orchestra. George is at Oundle School studying for his GCSE’s this year. He is planning to study Biology, Chemistry, Physics and Maths at A level. He sings in the Oundle School Chapel Choir and has taken his grade 7 singing. He continues to play the clarinet, working towards his grade 6 and is a member of the CCF Marching Band and the Wind Orchestra. Henry and George played in the CCF Band when it was invited to play at halftime during the match between Northampton Saints and Harlequins at Franklin Gardens on 27th February. Both Henry and George are regular members of the Oundle School Swimming Team. Alice is in her last year at St. Hugh’s School, Woodhall Spa and is going to be starting school at Lincoln Minster in September. She plays the flute in the school orchestra and is working towards her grade 4. Phoebe received a scholarship to Magdalen College School for the sixth form and will be going to read medicine next year. Paddy received an all rounder scholarship to Radley and is playing rugby for the Wasps Academy. Elizabeth has been awarded both an Academic and an Art Scholarship as she moves into middle school at Oakham. Edward has just completed his GCSE’s and is hoping to study A level Maths, Further Maths, Physics, Chemistry and Business. Tell us what you are doing now! Please, contact us. 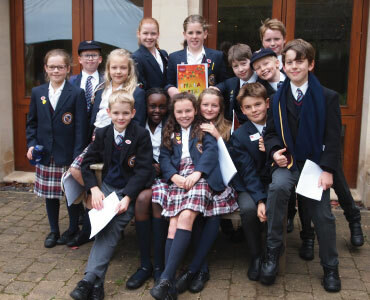 We are always delighted to receive news of past pupils and endeavour to put them in touch with their peers. For security reasons we will not publish email addresses of past pupils on the website. Please contact the Grantham Preparatory International School via joanne.abbs@iesmail.com if you would like your achievements displayed on our website. “Dear old friends and current students of Grantham Prep, Harriet Earle and I, Sarah Bousfield, Class of 1999, always said that when we had finally finished our education which began at Grantham Prep, all those years ago we would take a photograph in our (silly looking) but hard-earned outfits and send it to you. We pass this photograph from August 2015 on to you with the hope that it inspires current students at Grantham Prep to carry on their education long after they leave your corridors and by way of thanks for the way you inspired us when we were your pupils. 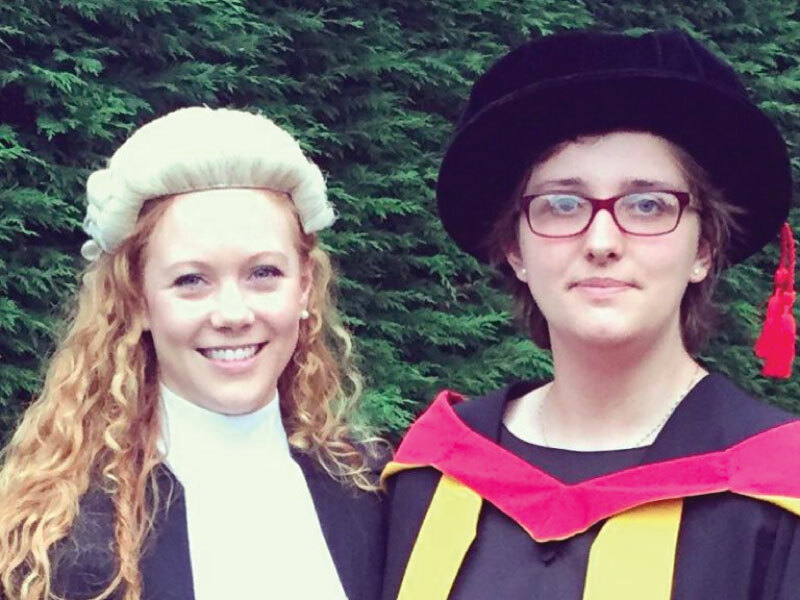 Harriet Earle is pictured wearing her PhD cap and gown having recently graduated from Keele University with a PHD in American Literature (her thesis was on conflict and traumatic representation in American comic books since 1975). She also holds a BA in English and American Literature from Keele University and two MAs in Theology from Nottingham University and Durham University. Harriet now teaches American Literature at Birkbeck University of London.